When you ask a fellow teacher or homeschool parent what classical education is, you’re likely to get a different answer every time. To one person it is the study of history chronologically, to another it is simply a challenging academic curriculum. To many, particularly in recent decades, classical education is seen as the application of Dorothy Sayers’ developmental model—the grammar, logic, and rhetoric stages of learning. It was inquirers like these that Tracy Lee Simmons must have had in mind when he pointed out, “We apply ‘classic’ or ‘classical’ to anything we believe to be excellent or universal.” (2) But is that all it is? One of the first things to do when you are looking for what a term means is to look at how it was used historically. What was the original meaning of the term “classical education”? If you reread the debates that took place in the early twentieth century, when classical education was under attack by the progressives, it was the teaching of Latin and Greek, and whether these two languages were still important in the modern world, that was the central flash-point of the debate. The chief argument of the progressives was that the classical languages were outdated. The use of these languages to read the classics was simply unnecessary, they argued, given the wide availability of English translations. 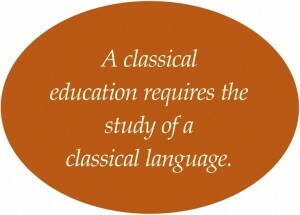 But classical educators knew that these arguments assumed a narrow view of the benefits of classical languages. This is why, when classical educators met at Princeton College in 1917 to try to regroup their forces in the face of the progressive onslaught, they chose to take their stand on the benefits of Latin. Two books which eloquently communicate the enormous benefits of the study of the classical languages are R. W. Livingstone’s A Defense of Classical Education (1917) and Charles Bennett’s The Teaching of Latin and Greek in Secondary Schools (1900). In fact, it was these benefits of Latin that were a centerpiece in the document that rebooted classical education in the late 1980s—Dorothy Sayers’ essay “The Lost Tools of Learning.” That essay and the book Recovering the Lost Tools of Learning, by Douglas Wilson, together spawned the modern classical education movement that is even now asking what it is and what it is for. In other words, in order to gain a competent grasp of grammar, one needs to study a language other than English, since English is uninflected and therefore too analytical and abstract. Second, because it is an inflected language, Latin is the best language to use because it makes the study of grammar concrete and because of the historic ties of Latin to our own language and culture. Comparison and contrast are the two basic thinking skills, and the Latin grammar is full of them. “It need not be pointed out,” says Livingstone, “that the study of a language like this is a good mental discipline, an exercise in precise expression, in correct dissection of thought.” There is no better critical thinking skills program than Latin. The classical languages are too historically bound up with classical education to allow for their separation without a cost. It is not too much to say that a classical education requires the teaching of a classical language, and, historically, that language was Latin. This was the hill on which the old classical educators chose to fight and die, and it was the lynchpin in Dorothy Sayers’ case for the trivium. For the classical educator, Latin is not an option—it is an essential. It is the sine qua non, that “without which” a classical education is “not” classical. (1) E. Christian Kopff is the author of The Devil Knows Latin. He is Associate Director of the Honors Program of the University of Colorado, Boulder. (2) Tracy Lee Simmons, Oxford University graduate in classics, author of Climbing Parnassus: A New Apologia for Greek and Latin. I have tried to teach grammar without Latin. I have actually taught grammar through Latin. Yes, Latin teaches lots of things, however, grammar seems to be the most important thing it teaches. I don’t think there are many great arguments for other, better ways to teach grammar, so I suspect that most people think that learning grammar is a waste of time. In my mind, it really boils down to — do you want your child to learn grammar or not? And frankly many people have no idea why learning grammar would be useful, much less fundamental. So, yes, I agree Latin is not optional……if you understand why it is important and do not be “classical education” as a “trend”.